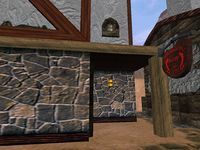 The Draggin Tale is a tavern in Stros M'Kai, across the town plaza from the Temple of Arkay and northwest of Rollo's house. According to the sign out front, it was established in 2E 284, making it 580 years old. Dreekius is the owner and works behind the counter as a bartender. Tobias sent a letter to Cyrus asking him to meet him at the Draggin Tale Inn. He will be there until you contact the League and, if you asked him the topic "Leaving", Dreekius will give you some gold he left for you. Some local Forebears frequent the inn, and you can brawl them without penalty. The Draggin Tale itself is one of the larger buildings in town, with a second floor balcony inside. The head of a dragon is mounted above the fireplace; Dreekius says the dragon attacked his home village, Noota Nara, in Black Marsh. This page was last modified on 3 September 2018, at 22:31.